Experience the high-octane distortion with limited-edition looks. 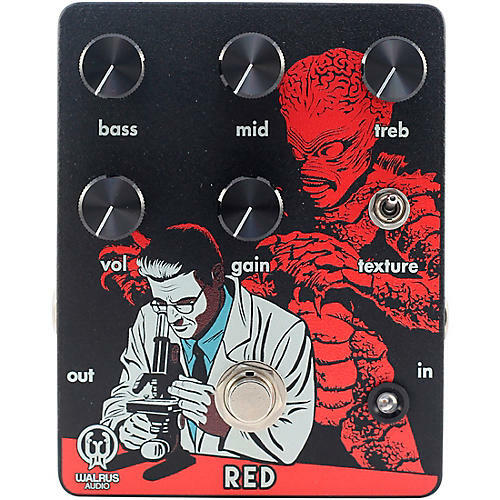 The Walrus Audio Red is a mean, heavy, have-no-mercy distortion pedal. Inspired by the brutal, heavy tones found in classic metal and '90s shoegaze bands, Walrus Audio has designed a high-gain distortion that is capable of achieving aggressive, pounding, thick tone that will appeal to everyone from skate punks, to heavy-hearted chord spillers, to the Swedish Death Metal players. The Red is a versatile distortion that is sure to become the new high gain staple on players’ boards everywhere. The Texture switch provides two different configurations of clipping diodes. The down position selects the highest level of compression and clipping available. Use this mode for smooth singing leads and heavily compressed rhythm work. The up position selects the lowest level of compression and clipping available. Use this mode for a more course tone that is more overdrive-like in nature. The Red comes in a lightly textured black finish with red and white ink. Original artwork features a scientist looking into a microscope discovering the virus that is, The Red. Enclosure’s exact size is 3.68” x 4.67” x 1.54”. Power requirements are 9VDC (100mA minimum). Dimensions: 3.68 x 4.67 x 1.4 in.